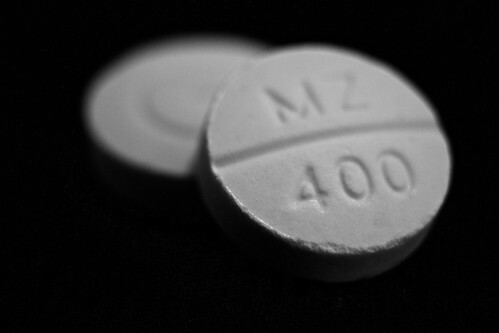 Metronidazole a photo by BaboMike on Flickr. Ah, antibiotics. I try to not use you often. Only in times of need. I feel that we, as people generally overuse them. But sometimes, its the right thing to do. Me? I seem to have contracted some kind of intestinal infection, with the only symptom of going “ouch” when prodded in the wrong place. Still, the doc, while puzzled, gave me a combo of pills, Metronidazole and Keflex. Both target at the gut. Well, it seems to have worked. The spot that goes “ouch” no longer goes “ouch”. The side effect of helping clear my cold out is appreciated too. Why this pic? Well, playing with the macro gear again. Damn its hard hand held, but fun. I love macro. Its true ghetto macro too. My gear is ancient Canon FL lenses adapted to EOS. I think it was all built in or around the late 60’s, but still gives current gear a run for quality. Better considering its low cost. Manual focus is hard, but with the magnified screen is made much easier. Tripod is easier again. Gotta practice more. are these amnesia pills or what? Where are the photos? Someone enjoys them you know, so get your a** into gear. Its a good project, and a few misses don’t matter.